“We all know that sugary carbonated beverages have been a huge factor in the obesity epidemic, and many people try to stop drinking soda, but it's hard to transition away from it. We aim for our cup to help people stay away from the beverages that do more harm than good." Today, Americans are experiencing an epidemic of obesity with the average American drinking approximately 42 gallons of sweetened beverages each year. While it’s easy to say drinking more water instead of soda is the solution, one of the biggest pitfalls is that water alone is a boring drink. 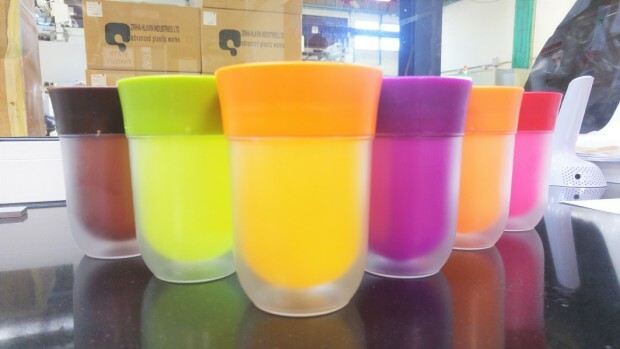 The makers of The Right Cup are looking to change that by using a combination of scent and taste; The Right Cup tricks users into thinking they’re drinking flavored water from this flavor cup. While the tongue only can taste five sensations (sweet, bitter, sour, salty and umami), the sense of smell is responsible for 80% of the flavor experience. This science is why when your nose is stuffed, you’re unable to taste much of anything. “We all know that sugary carbonated beverages have been a huge factor in the obesity epidemic, and many people try to stop drinking soda, but it’s hard to transition away from it. We aim for our cup to help people stay away from the beverages that do more harm than good.” – Isaac Lavi, Co-Founder, and CEO of The Right Cup. For those concerned about safety, it’s worth noting that The Right Cup uses FDA approved aromatic fruit flavors which are the same as those used by beverage companies in their drinks. The flavor cup is designed to position the nose right over the opening, so the nose picks up the fruit aroma while the tongue detects a sweet taste. This combination of sensations tricks the brain into thinking that it’s tasting flavored water. The Right Cup is sized 81.3 mm x 113.5 mm, and can hold 320 ml or 10.8 oz. It’s comprised of three components – the ring, inner cup, and outside cup. The flavor cup comes in a variety of flavors including orange, mixed berry, cola (suggested to be used with carbonated water), grapes, apple, and peach. So far the makers of The Right Cup have raised over $1.5 million via crowdfunding which is 864% of their $50,000 funding goal. Pricing for the device starts at $29 which is 22% off the suggested retail price. It’s worth noting that the aroma inside the cup will degrade after being removed from the packaging, which is why it’s recommended to store the cup upside down after opening and after washing when dry. In ideal conditions, the aroma taste effect can last up to several months. Additionally, hot water can cause the flavor to degrade faster. I wonder what difference the carbonated water would do for the cola flavor. I understand that you might think it’s actually soda, but wouldn’t you get the same satisfaction from regular water? On the health side of things, I think this is a great product. I might curb the need for soda and fruit juices in the home, but I am curious how long it will actually last. As a tool to get people to stop drinking soda, I can see this being a major part of that. That is a great way to pitch the cup. I never really have any issue with drinking water. Usually is not the taste of it. Right off the bat, I am going to say that I will not drink more water because I am tricked into it. I like the idea for kids, but that is about it. For several months, in ideal conditions, I will be fooled by my cup. I wonder if you put beer in the cup if it will make me think I am drinking a flavored water. There is science behind it, so that helps. I wonder how many times you wash this thing before the scent just stops working. The article says 7 months. I read about this in the early going and really didn’t think the campaign could have been this successful. I guess I was wrong and when it comes down to it, you just never know what the investors are going to think of your product until they put the money down. Pretty neat concept and I can see it working as a novelty or on children, but even though the funding is there, is this really a product that lasts for the long term?